A second opinion was requested and my dad was transferred to Selayang Hospital, reputably the cancer centre amongst Government hospitals. The surgeon in-charge of my dad's case, Mr Raj immediately put my dad's fears at ease. He was very courteous, professional and most of all, a knowledgeable and experienced surgeon. 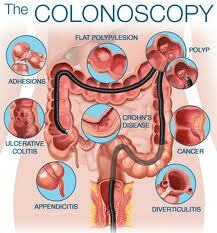 The prognosis was not good, he has colon cancer. Within days, he had scheduled my dad's surgery. 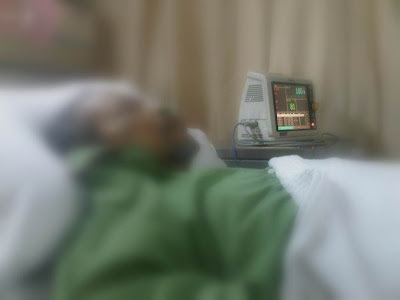 There were also indications that the cancer has spread to his liver and lungs. He stressed that the surgery was not a cure, but merely to 'improve his quality of life'. The night before, my mom stayed overnight together with me. At that point, I didn't know how or what to feel. My dad was understandably a bit nervous, but the sleeping pill given to him helps. The next morning, very early, the nurses came to ask him to get ready as he was the first on the list. The journey from the ward to the operating theatre seems a long one. We said our goodbyes and they wheeled him in. The look of sadness on my mum’s face was heart wrenching, and slowly I put my hand around her and lead her back upstairs to my dad’s room. Somehow we waited and waited, and yet there was no news about my dad. Time passed by …1 hour, 2 hours…5 hours. Could something have gone wrong? Asking the nurses didn't help either, coz every time they gave me the same standard answer..."nanti kita bagi tau". Luckily I knew someone who works in ICU, who then did some investigative work for me. "Belum lagi Rul, masih dalam OT" was the answer. That didn’t help. He called again 30 minutes later to tell me my dad was in recovery room. Still not getting any news from the nurses, I went down to ward 4A, the surgical ward for post ops cases. I went alone to ensure that everything is OK before my mum comes down. There he was, on the bed, on Epidural. The look of discomfort was on his face, but being dad, he didn’t complain. Luckily at the same time Mr Raj came by. My dad whispered that he was in great pain. The anaesthesiologist was called in and the Epidural dosage was increased. After that he was more at ease. The next day he was better, probably free from the hallucinating drugs. He was no longer in pain and you could almost see the energy returning back to his body. Surprisingly, on the 4th day, Mr Raj discharged him from the hospital. When I arrived that afternoon (you cannot stay at the wards after 7am until afternoon), he was all packed and ready to go…hahaha. Throughout the ordeal, I was there to look after my dad, as I was 'more independent' than my siblings. I am thankful to have a very understanding wife as I was away most of the time. 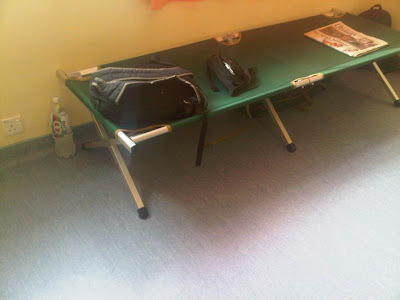 Ampang Hospital was the best, as I had brought my camp bed along as the picture above. Selayang Hospital was still a bit conservative, as they still have the nursing/medical staff from the older generation, thus I had to make do with the hospital armchair as a bed. It has been a long time since I had updated my blog. The main reason was, earlier on this year, my dad had some medical problems. One day, I received a call from my sister saying my dad was some serious stomach pains. You see my dad is quite reserved, funny and one who has above normal tolerance to pain or disgusting people (unlike his son haha). So when he is groaning in pain, it means that it was a above normal level of pain. Administering some skills I learned as a rescuer, the pain subsided when he finally went to the toilet. My dad refused to go to the hospital, so since his pain has subsided by about 90%, I decided to have a pep talk with him later. The reason why my dad refused to go to the hospital was more of a traumatic emotional scarring by the death of my youngest sister. My sister was born much later than me and my other 2 siblings, about 7 years later, thus she was the baby of the family. She spent the whole of Ramadhan in Kuala Lumpur General Hospital (HKL) with a condition that baffles the doctors. So it was a barrage of tests, including a trial and error application of medicines. Everyday without fail, my parents would visit her, and everyday they carried a change of her clothes, just in case the doctor would say "you are well and discharge". At that time, medical care at public hospitals were quite bad. Facilities were limited, patients were overwhelming and the medical staff were overworked. All these leads to nasty, foul mouthed nurses, whom during my late sister's tenure in the ward, had unleashed some of these unprofessional attitude to her and my parents. My dad had prayed for her to be discharged in time for Raya, and true enough, the doctors discharged her a few days before Raya. My parents were happy. However, on the second day of Hari Raya, she had a relapse of her symptoms and had to be brought back to the HKL. To cut the story short, that was to be her last Hari Raya with us. God had answered my dad's prayers, but her time was up. We were not prepared for her sudden demise. Everyone was shattered, and me being the eldest son, had to clench my teeth (to put on a 'strong face') and arrange for her burial. She died at the age of 15 years old. 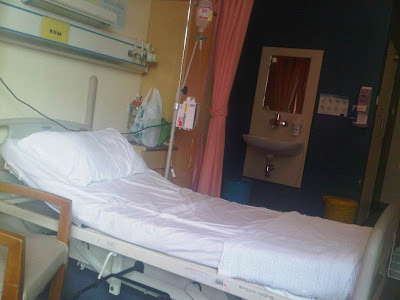 Ever since then, my parents had avoided going to hospitals, especially HKL. 2 weeks later, I had the opportunity to have a father-son chat with my dad. Finally he agreed to a check up at Ampang Hospital. With assistance from Ms Lynn, an appointment was arranged within days. As expected, he was admitted and a barrage of tests were performed on him too. While waiting during the Colonoscopy, a surgeon was called in. "This can't be good" I thought to myself. Sure enough they found a tumor which almost closed up his colon. An immediate surgical procedure was the only option.